EDITOR'S NOTE: This is a sample page to show that we create customized products for each of our client schools. Are you excited to share MyWorldAbroad with fellow students, staff and alumni? 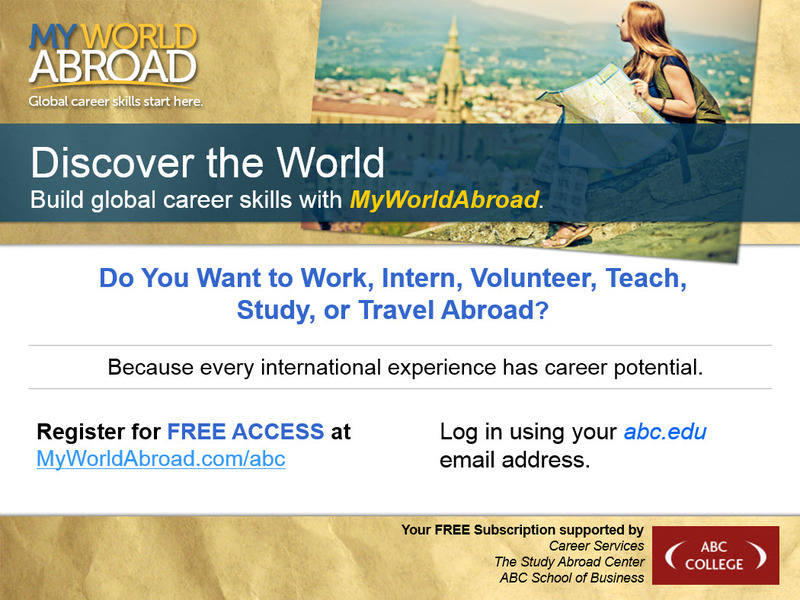 Then spread the word about FREE access to MyWorldAbroad.com and highlight the importance of going abroad to build international career skills. Contact our Client Services Representative to modify the above products or to request a version to customize on your own. 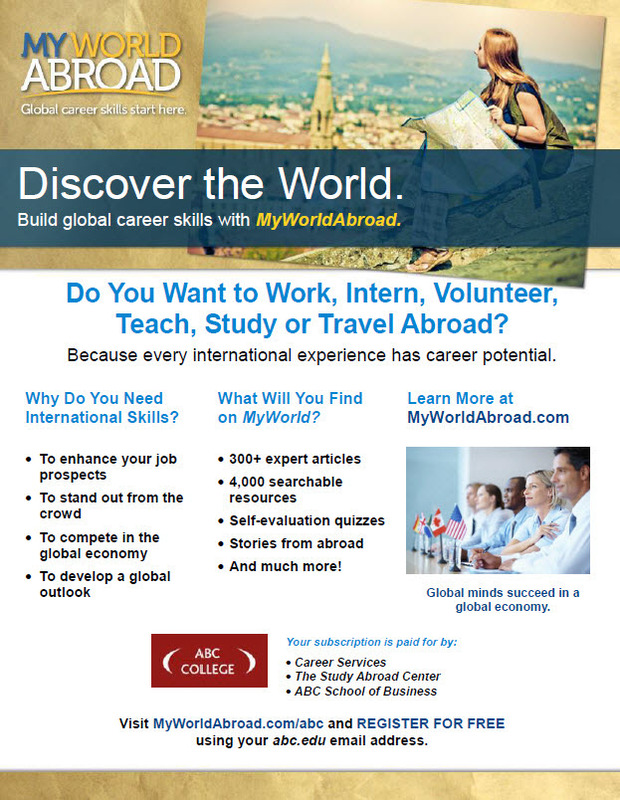 Display in your Career Center, Study Abroad and International Student Offices. Post on faculty and department bulletin boards. At the start of each semester, check to ensure that posters continue to be displayed. Display on your school’s electronic bulletin boards/blogs at regular intervals. Hand out to students while doing one-on-one student advising. 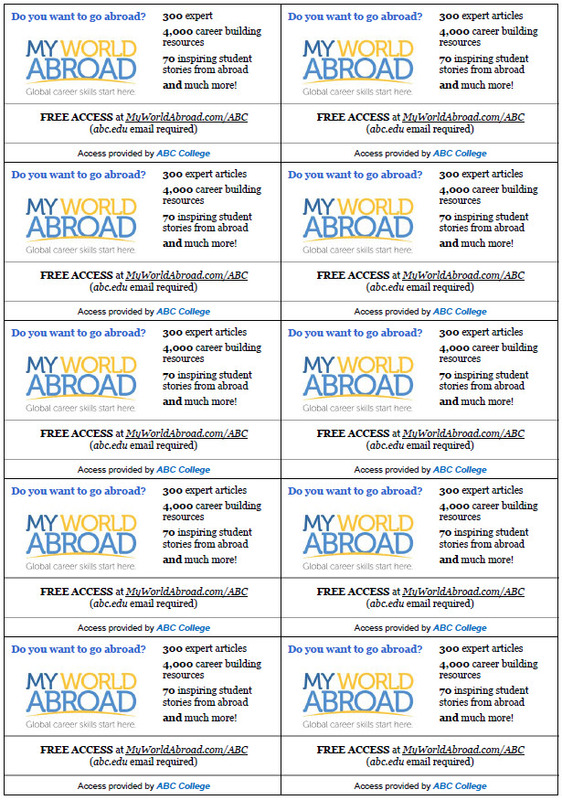 Set up a desk sign next to your office receptionist saying "ASK ME ABOUT GOING ABROAD" and hand these promotional cards to students visiting your office. Ask your office’s interns/student ambassadors to distribute these promotional cards on a weekly basis and/or whenever they have free time. Place promotional cards on tables in cafeterias or student lounges. Hand out to students in busy hallways. Distribute to attendees at international events (including all events during International Education Week held each year in early November). Distribute these promotional cards along with our Quick Guides.